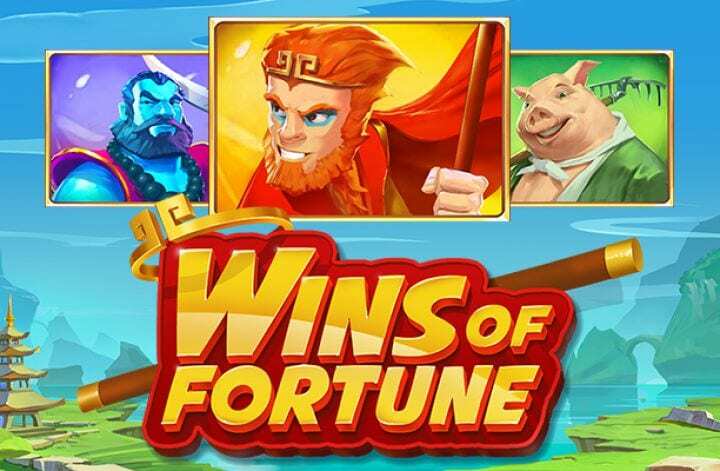 Here's a brilliant new slot game at www.Wizardslots.com, set in the beautiful valleys of Eastern Asia, Wins of Fortune is a tranquil slot that has a completely unique set up. Powered by Quickspin, the quirky martial arts theme and complex design of the game gives players the opportunity to experience something new. This slot sticks to a 5-reel setup but each individual reel has a different number of windows. As you hit winning spins, the incredible respin feature will expand the reels to give you more possibilities. 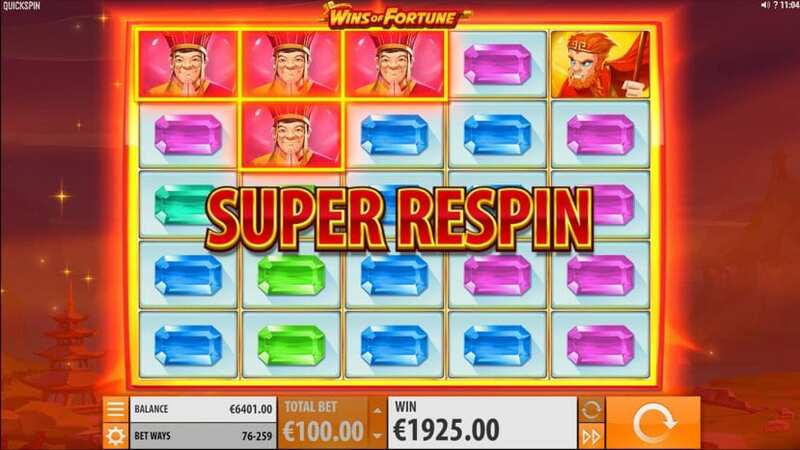 Expand all of the reels and you can activate the thrilling Super Respin feature. Broaden your gaming horizon and experience this great game today. Click here for more slot games. Greeted by peaceful tones, Wins of Fortune starts off slow but immediately becomes action-packed once the respin feature kicks in. The initial 3-3-4-4-5 setup can swiftly become a 5x5 board with up to 259 ways to win. * RESPIN FEATURE – Each winning spin in the base game will activate the respin FEATURE. For each respin, the remaining winning symbols stick as the reel furthest to the left is removed and replaced by a 5x5 reel furthest to the right. The respin feature will come to an end once there are no more winning combinations. * SUPER RESPIN FEATURE – The Super Respin FEATURE is triggered after the fourth winning respin and the gameboard has a 5x5 reel setup. During this feature, all winning symbols stick and it only comes to an end once no additional winning symbols appear on the reels. 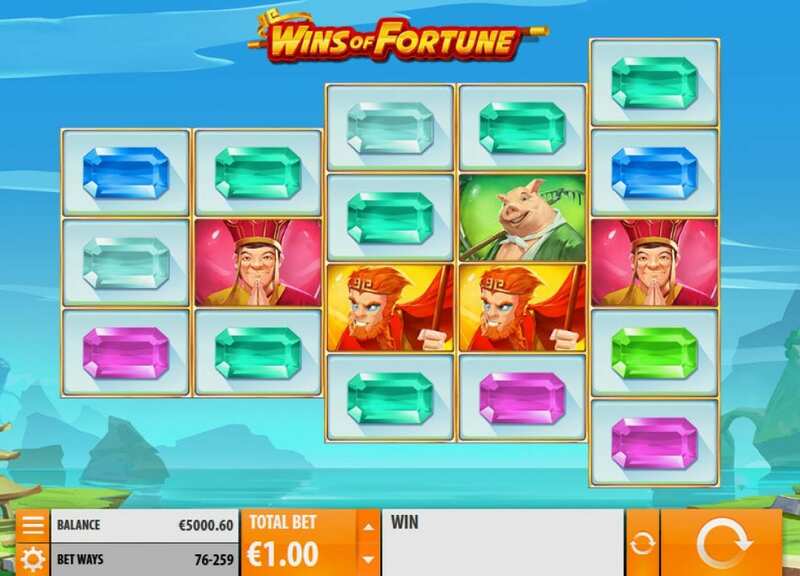 Wins of Fortune is undoubtedly an exciting game and immediately draws you in with its distinctive format. The vibrant design and smooth graphics are what you would expect from a Quickspin creation and Wins of Fortune are no different. Being able to re-spin on any win and the Super Respin Feature makes for a great game with constant cash prizes coming your way. Take a trip to the East and see what winnings you can bring home. If you enjoyed this game, why not try out Pied Piper.